The Story so far! Bubbles Shakes opened its first store in June 2013. Britain is known for their great heritage of chocolates and sweeties. The likes of Cadburys and Nestle have been making delicious chocolates and sweets for decades. 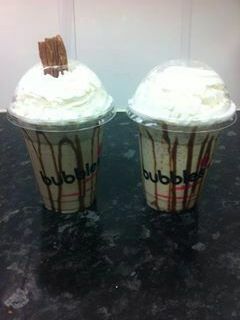 Why not use these great flavours to create outstandingly tasty milkshakes, which you the customer can relate to! We created our shakes by exploring all the avenues in trying to come up with a fantastically creamy ice cream which was non-dairy and which would compliment the different ingredients. After all the hard graft and hours of binging, we believe we have come up with a recipe, which is absolutely mind-boggling! Yes folks, it does seem like we are blowing our own trumpet, but to all those sceptics out there, we too agree in the saying, the proof is in the pudding! Don't believe us?! Give it a whirl for yourself! !